Sermorelin Acetate is an amino acid peptide used to stimulate your pituitary gland’s natural production of human growth hormone. In that way, it differs from Human Growth Hormone therapy, which seeks to directly replace HGH levels in decline. 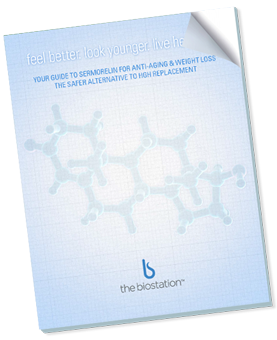 Sermorelin was developed in, and has been used since the 1970s, when researchers were looking for an effective method to treat declining levels of human growth hormone in adults. In middle age, HGH levels are typically less than half of what they were in a person’s early 20s. Sermorelin is a peptide, containing 29 amino acids, which can aid the production of HGH in the body during the sleep cycle. This results in a feeling of bodily rejuvenation upon waking, instead of the tiredness that never seems to go away as we age. One important thing to understand about Sermorelin is that it promotes healthy function of the pituitary (the gland responsible for our body’s production of HGH) during the aging process. The effects of Sermorelin are regulated at the level of the pituitary gland by negative feedback and by the release of somatostatin, so that overdose of HGH is difficult if not impossible to achieve.